Only $21.00 CAD (includes taxes) for 1 year subscription. Get the latest on lake living in Manitoba And Northwestern Ontario! Know a cottage with a story? We’re looking for unique cottages, of all shapes, sizes and descriptions, that may be unusual because of their design, history or owner. We always enjoy seeing cottagers’ creativity when it comes to their renovations or cabin décor, especially if it involves recycled items or materials. We hope readers find ideas from our content, and now we’d like to share your handiwork. 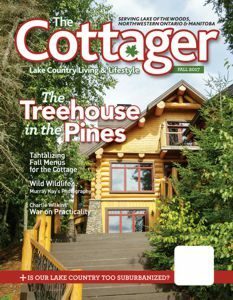 If you’ve re-purposed an item for your cottage and would want to show and tell readers how to do the same thing, please email a high resolution photo of the item and a brief description about it editor@thecottager.com, or mail to The Cottager and we may include it in an upcoming issue.